Since we’ve been around, we’ve seen the asbestos materials go away and about three generations of attempts to replace them. 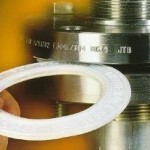 Gaskets for Today’s Sealing Challenges are recognized and addressed. There are some products available that are dependable. Sheets and gaskets can be made from compressed non-asbestos and rubber sheet gaskets, usually Kevlar aramid fibers with different rubber binders for different applications. However, there are two serious drawbacks with these products. First, the catalogs claim 600 degree F temperature capabilities. Yet, they are almost 80% rubber and none of the rubber used like SBR, EPDM, Buna-N or Neoprene are suitable much above a few hundred degrees F. How can this be? Well, the manufacturers and sellers don’t want the “competitive disadvantage” of telling you the complete story. We don’t recommend them above 300 degrees F. We know the “rest of the story” and we’ll share it with you. The other point to remember is that these materials have a very definite and relatively short shelf life. Neither you nor we know how old a sheet or gaskets might be before we ever get it. Just bend a piece of material around a dowel twice the thickness of the sheet. If it doesn’t break, it is usable.